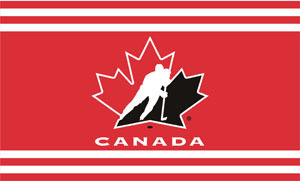 Canada just celebrated its 151st birthday, so we wanted to compile a list of which Canadian players The Hockey Fanatic feels are the beat in the game today. Of course “best” is a subjective term, so we based our rankings on which Canadian hockey players are currently at the top of their game from an athletic standpoint, an entertainment perspective, how valuable they are to their team and their respective league. this is an opinion based list… our opinion. You are entitled to your own opinion, this list consists of players whom The Hockey Fanatic feels are at the top of their game right now. This list is based on which Canadian players that, if we had a Hart trophy vote, we would give our vote to. Ok so before we get started, we did take into consideration point production over the past few years. We also looked at criteria such as fan impact, ability to make their team better, and we also looked at overall impact for a pure “game of hockey” perspective. There might be a few surprises on this list, but that is part of the fun when compiling lists such as this. 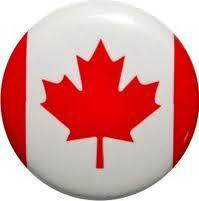 We feel that this list of twenty players exemplify the top Canadian players in the game today. We wanted to include female hockey players in the list, but we felt they deserve their own list so stay tuned for that in an upcoming post. With that, the Hockey Fanatic presents the Top 20 professional Canadian hockey players of 2018. #25. 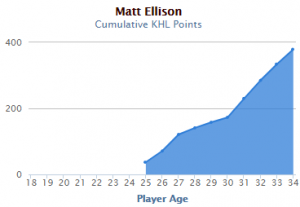 Matt Ellison – Forward for Metallurg Magnitogorsk (KHL) – Born December 8, 1983, Duncan, BC – you’re thinking “who”? For the past ten seasons, Matt Ellison has been putting up some great numbers in Russia’s Kontinental Hockey League. In fact in 2016, at the age of 32, Ellison scored 8 points in the KHL all-star game playing for Team West where he tallied 7 goals and added an assist. In 477 games in the KHL, Ellison has put up 379 points for a points-per-game ratio of 0.795, highest of any Canadian born player in the KHL who has played more than 60 career games in the K. If that’s not enough, check out his point trajectory during his time over in Russia. #24. Kris Letang – defense for Pittsburgh Penguins (NHL) – born April 24, 1987 in Montreal, Quebec. Letang has had a couple of major injury setbacks in recent years, but he has quietly piled up a lot of points in his career with the Pens. Did you know that Letang has 79 career playoff points in 128 games? He’s also amassed 24 Game Winning Goals in his career. #23.Duncan Keith – defense Chicago Blackhawks– born July 16, 1983 in Winnipeg, MB. This former Kelowna Rocket is approaching 1,000 games played in the NHL, has three Stanley Cups to his name and a couple of Olympic gold medals. He is still one of the greatest Canadian born players in the game today. Had a bit of an off year as did the Blackhawks, but Duncan Keith is still a defenseman worth having on your team. #22. Mathew Barzel – forward New York Islanders – born May 26, 1997 in Vancouver, BC. In his rookie NHL season, hockey fans took note of Barzel as he posted 85 points in hos rookie season. This guy has explosive speed and looks like he could be one of the games elite forwards by the time he is 25. Drafted 16th overall in 2015, on a pick claimed from the Edmonton Oilers, the New York Islanders did well in selecting this former Seattle Thunderbird. #21. Mitch Mariner – forward Toronto Maple Leafs – born May 5, 1997 in Markham, Ontario. Part of the current youth movement in the NHL. In two NHL season Mariner has put up point totals of 61 and 69 points respectively and is one of the games best up and coming players on a Leafs team on the rise. He’s durable too, having played in 97% of his total games. The kid can produce. He put up 301 points in the OHL with the London Knights in 184 games. He’s a point-per-game player in the playoffs as well. #20. Alex Pietrangelo – defense, St. Louis Blues – born Jan. 18, 1990 in King City, ON. Yet another defenseman on our list of top 25 Canadian hockey players in 2018. Drafted fourth overall in the 2008 Entry draft, has already played over 600 NHL games and already had six season where he has put up 45 or more points in the season from the backend in St. Louis. #18. Carey Price – goaltender, Montreal Canadiens – born August 16, 1987 in Vancouver, BC. While Price had an off year last season, he remains one of the top goaltenders in the NHL. He has a career 0.918 save percentage in nearly 560 NHL games. In 2014-15 he put up staggering numbers with a 1.96 goals against average and a 0.933 save percentage while amassing 44 wins for the Montreal Canadiens that season. Injuries have slowed him down a bit, but he’s still one of the best Canadian based goaltenders in hockey. #17. Marc-Andre Fleury – goaltender, Vegas Golden Knights – born November 28, 1984, Sorel-Tracy, Quebec. The reason the Golden Knights went to the Stanley Cup finals in their first season? Probably the stellar play of Fleury. How the Penguins let this guy go is still a head shaker for us. He’s won three Stanley Cups in 2009, 2017 and 2017 and had his best save percentage of his career this past regular season (0.927) and his best goals against average at 2.25. He has over 400 career wins in the NHL. He’s getting better with age. #16. Brad Marchand – forward, Boston Bruins – born May 11, 1988, Halifax, Nova Scotia. While former NHLer Pat Verbeek was known as “The Little Ball of Hate”, the same could be applied to Brad Marchand. While this guy is not going to win any Lady Byng trophies anytime soon, he does put up some good offensive numbers for the Bruins. Back-to-back 85 point seasons are nothing to sneeze at. #15. Tyler Seguin – forward, Dallas Stars – born January 31, 1992 in Brampton, Ontario. Over the past five seasons Seguin is a consistent 70-80 point player. This passed season he netted 40 goals for the Stars averaging nearing one goal every second game. He’s just entering his prime. #14. Claude Giroux – forward, Philadelphia Flyers – born January 12, 1988 in Hearst, Ontario. Giroux posted his first hundred point season in the NHL last season finishing with 102 second to Connor McDavid (108). Along with Blake Wheeler from the Winnipeg Jets, Giroux lead the NHL in assists with 68 and was a plus 28 on the season. #13. Jamie Benn – forward, Dallas Stars – born July 18, 1989 in Victoria, BC. Another ex-Kelowna Rocket. I loved watching Jamie in Kelowna, we could tell that he was going to be something special. As a Rocket he posted 82 points in 56 games in his final season in Kelowna before moving on the the NHL. He posted 36 goals this past season his most since netting 41 in 2015-16. A great leader on a Dallas team that is up and coming. #12. Braden Holtby – goaltender, Washington Capitals – born September 16, 1989 Lloydminster, Saskatchewan. An AHL Calder Cup champion in 2010 and an NHL Stanley Cup champion in 2018. Holtby is one of the top goaltenders in the NHL. The past four NHL seasons this guys has done nothing but put up wins for the Caps with win regular season win totals of 41, 48, 42 and 34 respectively. Easily one of the top Canadian goalies in the game today. #11. Devan Dubnyk – goaltender, Minnesota Wild – born May 4, 1986 in Regina, Saskatchewan. Drafted 14th overall by the Edmonton Oilers in 2004, Dubnyk has improved his game so much so that he has a career goals against average of 2.54 with a 0.917 save percentage. His win/loss ratio is one of the best in the NHL in recent years. He’s been rock solid in net for the Minnesota Wild. Well we are half way there. Here is a look at the top 10 Canadian hockey players of 2018. #10. Drew Doughty – defenseman, Los Angeles Kings – born December 8, 1989 in London, Ontario. One of the top right handed shot NHL defensemen playing in the league today. Doughty’s hard-nose style of player would be welcomed on any team. He put up a career best 60 points this past season and has played in all of his team’s 82 regular season games the past four seasons. Durable, tough and can produce. Perhaps we should have him higher up on our list? #9. P.K. Subban – denfenseman, Nashville Predators – born May 13 1989 in Toronto, Ontario. Only a few months older than Doughty, Subban is one the games greatest defensemen. He scored a career best 16 goals this past season while amassing 59 points on a Nashville team which seems to be loaded with defensive jems. He’s a great personality and one of the most entertaining players in the game. He’s nearing 400 career points in the NHL. #8. 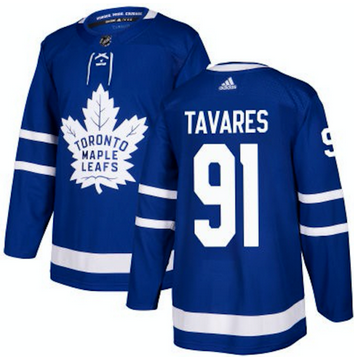 John Tavares – forward, Toronto Maple Leafs – born September 20, 1990 in Mississauga, Ontario. So the Leafs landed possibly the most coveted free agent in the history of the NHL. Tavares posted 621 points in 669 games as a member of the New York Islanders. He’s coming off a season where he scored 37 goals and 84 points. Is this the next Leafs captain? Perhaps, but he definitely comes in as one of the top forwards in the game today. #7. Nathan MacKinnon – forward, Colorado Avalanche – born September 1, 1995, Halifax, Nova Scotia. In his fifth NHL season, we finally saw what we have been expecting from MacKinnon since he was drafted first overall by the Avs in 2013. Potting 39 goals and 97 points MacKinnon was one of the top players in the NHL this past season. He’s the new leader in Colorado and at twenty-two years old is not even in his prime yet. Youth is king in the NHL. #6. Mark Scheifele – forward, Winnipeg Jets – born March 15, 1993 in Kitchener, Ontario. Scheifele is one of our favorite players, and had a tremendous playoff for the Jets scoring 14 goals and 20 points in 17 playoff games this past spring. Almost a goal a game… and in the playoffs? Crazy stats. He was injured for part of the season but was still a point-per-game player with 60 points in the 60 games he played. He scored 82 points the previous season, his offensive production is tending up nicely. #5. Steven Stamkos – forward, Tampa Bay Lightning – born February 7, 1990, Markham, Ontario. Stammer is six season removed from his 60 goal season, but last season he posted his highest point total since potting 60 in 2011-12. The Lightning are stacked and poised to take a run at the Stanley Cup. Steven Stamkos leads by example and is in his prime. Expect big things this season from Stamkos. #4. 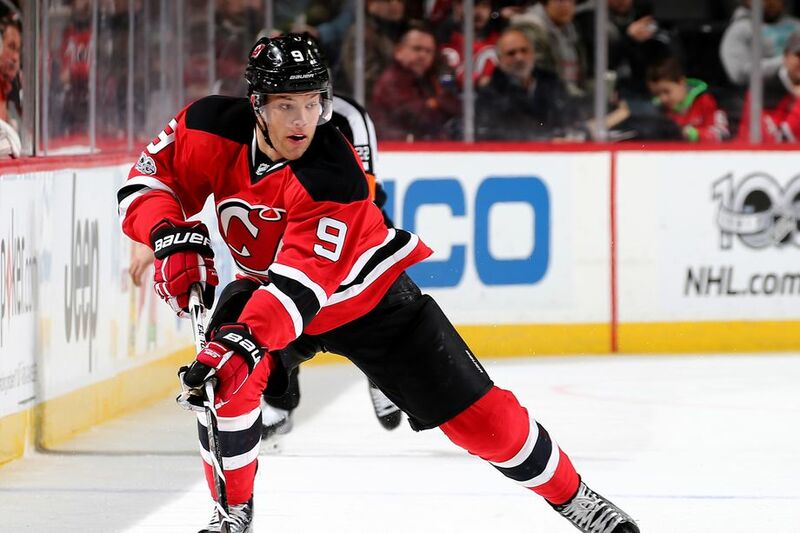 Taylor Hall, forward, New Jersey Devils – born November 14, 1991 in Calgary, Alberta. The reigning MVP of the NHL. Taylor Hall is one of the best wingers in the game today and he proved it this past season, his second with the New Jersey Devils. Hall posted 39 goals and 93 points in 76 games for the Devils earning him the Hart trophy as the league’s most valuable player. Probably what’s most impressive was the 26-game point string Hall amassed this season. The streak was on par with one Wayne Gretzky had in 1983-84 according to statistics. Hall has either scored or assisted on 50.7 percent (38 of 75) of New Jersey’s goals during his streak, 0.5 percent less than Gretzky’s 51.2 percent (153 of 299). How Peter Chiarelli still has a job in the NHL after trading Hall from the Oilers to the Devils for Adam Larsson is a mystery (Chiarelli also traded Tyler Seguin from the Bruins to Dallas.. yikes). #3. Brent Burns, defenseman, San Jose Sharks – born March 9, 1985, Ajax, Ontario. The top Canadian-born defenseman in the game today. His past four seasons, Burns has put up point totals of 60, 75, 76 and 67… these are totals that most forwards would love to have. Barring injury this season, Burns will play in his 1,000th NHL regular season game and the Sharks are looking to win now. He’s one of the best d-men in the league. #2. Sidney Crosby, forward, Pittsburgh Penguins – born August, 1987, Cole Harbour, Nova Scotia. Sid the Kid is not a kid anymore, but he’s still one of the best players in the world, having won three Stanley Cups with the Pittsburgh Penguins. All this after coming back from pretty serious concussion-related injuries. In his past five seasons, Crosby has put up point totals of 104, 84, 85, 89 and 89 with the Pens. The “Kid” has put up over 1,100 points in 864 career regular season games and recently won back-to-back Stanley Cups. #1. 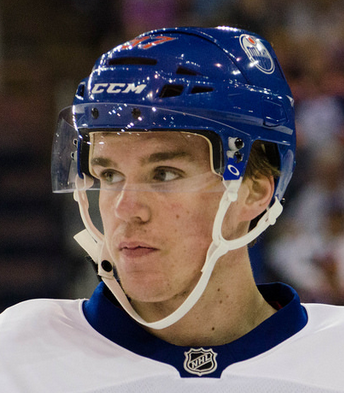 Connor McDavid – Centre for the Edmonton Oilers – Born Jan 13 1997 – Richmond Hill, ON. Not only did Connor McDavid lead the NHL in points for the second consecutive year getting 108 on a fairly bad Edmonton Oilers team, but he was voted the most valuable player by his peers. What hasn’t been said about Connor McDavid? He gets top marks for skill and entertainment value. He is a real treat to watch. We really like his compete level and he is a great fit as captain of the Oilers, even at 21 years of age. Look for this guy to have an even more dominant season in 2018-19. There you have it, The Hockey Fanatics’s list of the top 20 professional Canadian players in the game in 2018. Disagree with our picks? Follow us on Twitter and let us know which players you may have included. ← Does the NHL have an issue with Concussions/Head Trauma Related Injuries?